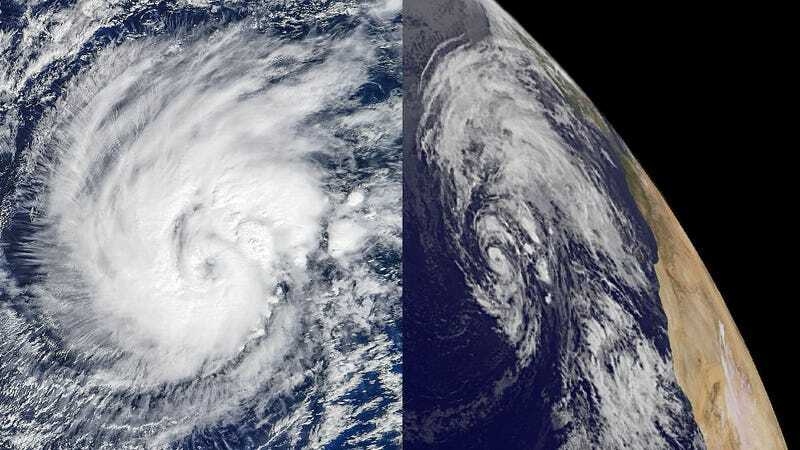 For the first time since records began, two tropical storms—one in the Atlantic and one in the Pacific—have appeared at the same time in January. Named Alex and Pali, these storms are being fueled by unusually warm surface waters. On their own, these early storms are rare occurrences. But the fact that they’re appearing at the same time in January is altogether unprecedented. Normally, a converging event like this wouldn’t happen until July. Earlier this month, the remnants of a tropical depression left a large area of moisture across the equatorial Pacific. This, combined with powerful westerly winds and high sea surface temperatures fueled by El Niño, contributed to the rise of tropical storm Pali. On January 11, the system strengthened into a hurricane, becoming the earliest hurricane ever recorded over the Central Pacific Basin during a calendar year. Pali was designated a full-blown hurricane 19 days earlier than the previous record holder, Hurricane Ekeka. Pali’s path and location are shown in red. The blue lines represent storms that have been tracked by the NOAA from 1842 to 1842. Via Joshua Stevens using data from NOAA and Unisys Weather. Meanwhile in the Atlantic Ocean, meteorologists recently noticed an extratropical low forming about 425 miles (685 km) west of Bermuda. On January 13, the system erupted into a full-blown tropical storm, which necessitated a formal naming. Called Alex, it’s now the earliest forming Atlantic storm to receive a name. What’s more, it’s the first tropical or subtropical storm to form in January since 1978, and it’s only the fourth known tropical or subtropical cyclone to form during the month on record. 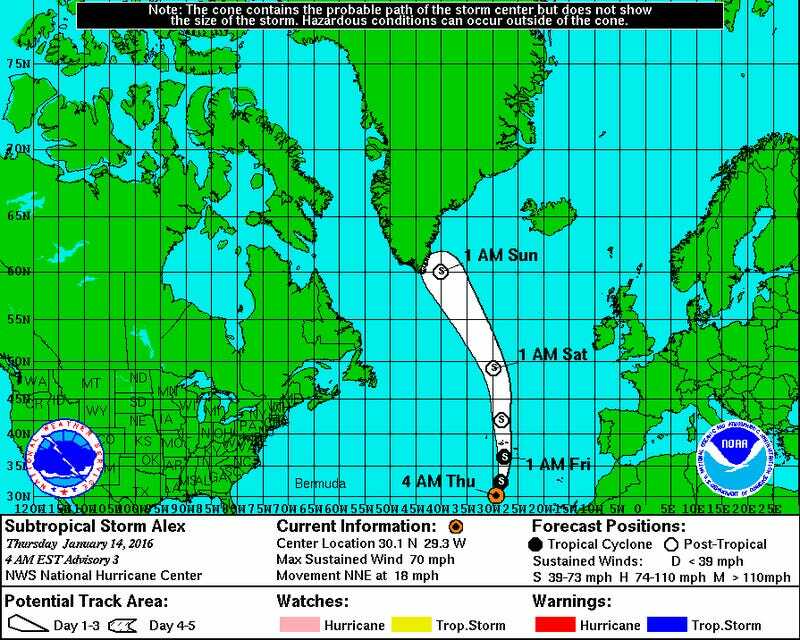 Tropical storm Alex is currently making its way northwards. Via NOAA. Climate change is a likely culprit in both cases. In the Atlantic, there’s enough heat in the surface waters around the Bahamas and eastwards to keep storm circulation going. And of course, El Niño is another factor, so we may not witness anything quite like this until the next one comes around. Or this could be a sign of the new normal. Last year’s hurricane season was equally strange, one that included the ferocious Hurricane Patricia and three Category 4 storms in the Pacific at the same time. Top image: NASA image of Pali (left) by Jeff Schmaltz, LANCE/EOSDIS Rapid Response, NASA image of Alex (right) NOAA-NASA GOES project.